JC9758. Azurite, malachite. Milpillas mine, Cuitaca, Municipio de Cananea, Sonora, Mexico. 4 x 6.5 cm 60g. $365.00. A two centimeter main crystal with satellite crystals attached. The back of the main crystals, not visible in this photo, were in contact with the pocket walls, so parts of the crystals are a bit flat. These are the brilliant crystals with an almost Schiller like luster, where the original crystals were partly replaced by malachite and then a thin layer of azurite crystallized on the malachite, giving this incredible luster the Milpillas azurites are famous for. 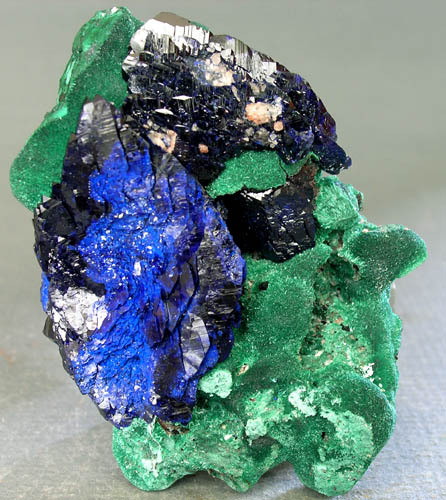 The visible malachite is for the most part the thin layer of malachite that in the top half of the specimen is now azurite. JC9758. Back side of the specimen. JC9677. Azurite. Christiana mine, Kamariza mines, Agio Konstantinos, Lavrion district mines, Lavreotiki, East Attica, Attica, Greece. 5 x 9 cm 170g. $90.00. 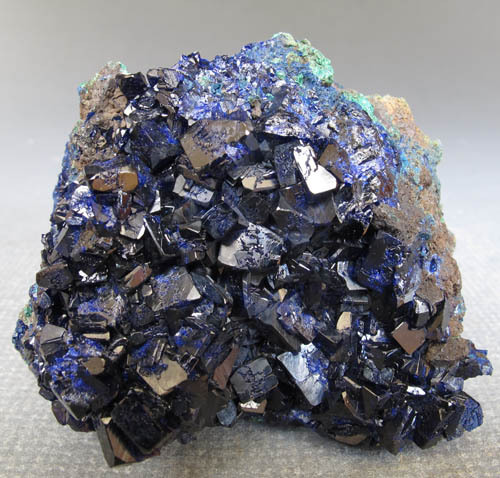 A nearly solid mass of azurite with somewhat crude crystals coating the top of the specimen. From the 2012 find. JC9674. Azurite. Chessy copper mines, Chessy-les-Mines, Villefranche, Rhone, Avergne-Rhone-Alpes, France. 2.6 x 3.2 cm. 33g. $115.00. Nice little nodule of blue crystals typical for Chessy. Probably the Blue mine, noted for its azurite. JC9619. Azurite, malachite. Blue Jay mine, Big Eightmile creek, Leadore district, Lemhi county, Idaho. 4 x 6.5 cm 76g. $15.00 Drusy micro crystals with minor malachite in small spherules. Sawn back. JC9622. Azurite. Blue Jay mine, Big Eightmile creek, Leadore district, Lemhi county, Idaho. 3.5 x 5.3 cm 46g. $12.00. Sawn back. JC9634. Azurite, malachite, tenorite. Blue Jay mine, Big Eightmile creek, Leadore district, Lemhi county, Idaho. 3.5 x 6.5 cm 42g. $12.00. JC9537. Azurite, tenorite. Blue Jay mine, Big Eightmile creek, Leadore district, Lemhi county, Idaho. 5.5 x 7 cm 183g. $35.00. Sparkly dark blue crystals with minor tenorite as a black contrast. Minor azurite on the back. From a small breccia pipe in altered granitic rock. The granite in the breccia pipe is highly fractured and the breccia fragments are variously coated with mostly azurite, varying amounts of tenorite, and small amounts of light green zinc rich malachite. Nearly all the specimens have some amount of contact marks due to the tight nature of the breccia fragments cemented in the pipe. The original find I found in 2002 had more malachite on the specimens and much less tenorite. JC9538. Azurite. Blue Jay mine, Big Eightmile creek, Leadore district, Lemhi county, Idaho. 4.5 x 8 cm 224g. $35.00. Sparkly blue azurite on the front, with about 1/4 of the back side also coated with azurite and tenorite. From a small breccia pipe in altered granitic rock. The granite in the breccia pipe is highly fractured and the breccia fragments are variously coated with mostly azurite, varying amounts of tenorite, and small amounts of light green zinc rich malachite. Nearly all the specimens have some amount of contact marks due to the tight nature of the breccia fragments cemented in the pipe. The original find I found in 2002 had more malachite on the specimens and much lesser tenorite. JC9539. Azurite. Blue Jay mine, Big Eightmile creek, Leadore district, Lemhi county, Idaho. 5 x 8.5 cm 269g. $25.00. Sawn base. Back side is about 20% coated with azurite and some tenorite. JC9541. Azurite, tenorite. Blue Jay mine, Big Eightmile creek, Leadore district, Lemhi county, Idaho. 3.5 x 9.5 cm 96g. $35.00. Sawn back. Sparkly azurite is dark blue...a little darker than in the photo. JC9542. Azurite, tenorite. Blue Jay mine, Big Eightmile creek, Leadore district, Lemhi county, Idaho. 7.5 x 9 cm 320g. $30.00 Sawn back. Dark blue azurite, a little darker than in the photo. The backside is sawn and shows the brecciated nature of the rock rather nicely. JC9543. Azurite, tenorite. Blue Jay mine, Big Eightmile creek, Leadore district, Lemhi county, Idaho. 7.5 x 9 cm 233g. $30.00. Sawn back. Dark blue azurite a little darker than the photo shows. The backside is sawn, and shows the brecciated nature of the rock rather nicely. Black tenorite is interspersed with the azurite. JC9544. Azurite, malachite. Blue Jay mine, Big Eightmile creek, Leadore district, Lemhi county, Idaho. 6 x 11.5 cm 255g. $25.00. A small amount of malachite as well as azurite is on the back side. JC9545. Azurite. Blue Jay mine, Big Eightmile creek, Leadore district, Lemhi county, Idaho. 6.5 x 9.5 cm 247g. $30.00. Sparkly drusy azurite. 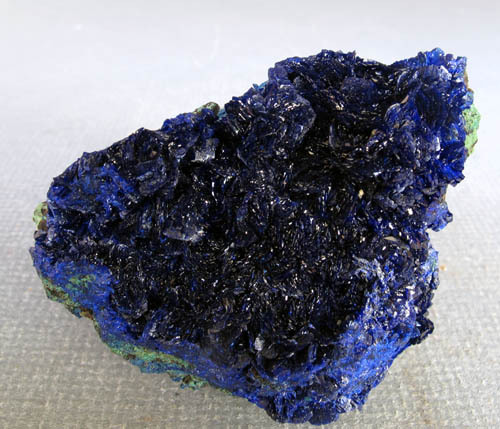 Azurite is partially coating the bottom and side of the specimen. JC9546. Azurite. Blue Jay mine, Big Eightmile creek, Leadore district, Lemhi county, Idaho. 5.5 x 8.5 cm 241g. $30.00. Sparkly azurite. The white area on the front is where a fragment of granite was broken off the specimen. JC9547. Azurite. Blue Jay mine, Big Eightmile creek, Leadore district, Lemhi county, Idaho. 6 x 7.5 cm 180g. $30.00. 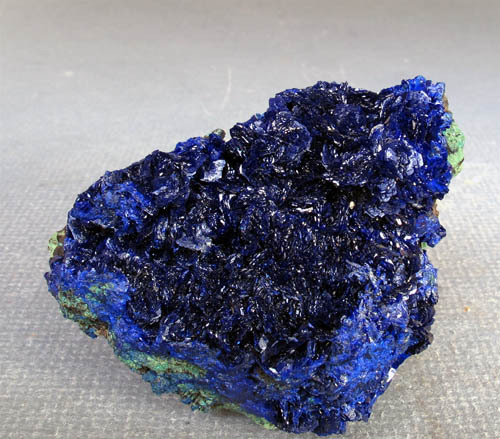 Sparkly azurite coats the front and sides of the specimen. Two views are shown. JC9549. Azurite, tenorite. Blue Jay mine, Big Eightmile creek, Leadore district, Lemhi county, Idaho. 5.5 x 11 cm 281g. $20.00. Slightly bubbly looking azurite in contrast to the black tenorite. JC9551. Azurite. Blue Jay mine, Big Eightmile creek, Leadore district, Lemhi county, Idaho. 5 x 8.5 cm 235g. $30.00. 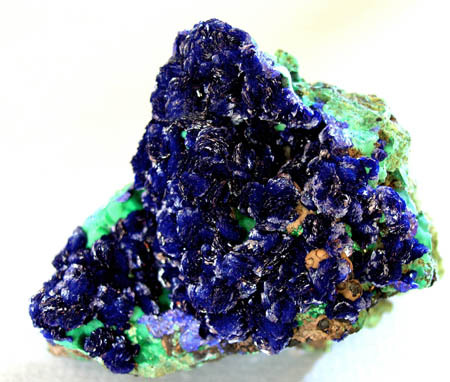 Dark to lighter blue sparkly azurite with a trace of malachite on the lower left. Minor tenorite is associated. JC9552. Azurite. Blue Jay mine, Big Eightmile creek, Leadore district, Lemhi county, Idaho. 6 x 8 cm 110g. $18.00 Small sawn area on back. Sparkly azurite coats the face with black tenorite. JC9553. Azurite, tenorite. Blue Jay mine, Big Eightmile creek, Leadore district, Lemhi county, Idaho. 4.3 x 5.5 cm 83g. $13.00. Sawn back and base. Dark blue azurite on the front with abundant black tenorite. Very minor malachite is also present. JC9554. Azurite, tenorite, malachite. Blue Jay mine, Big Eightmile creek, Leadore district, Lemhi county, Idaho. 4.5 x 7 cm 97g. $13.00. Sawn back. Sparkly azurite scattered across the front with black tenorite mostly coating light green malachite. JC9555. Azurite. Blue Jay mine, Big Eightmile creek, Leadore district, Lemhi county, Idaho. 5.5 x 9 cm 205g. $20.00. 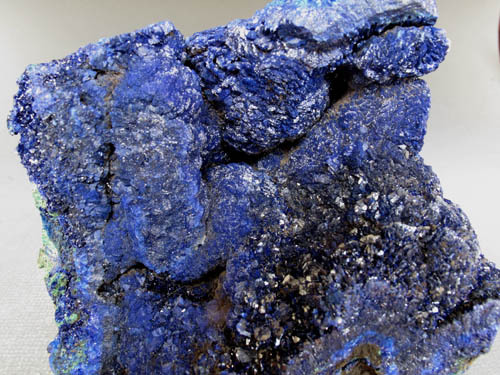 Lighter blue to dark blue azurite partially coating a highly brecciated matrix. Sparkly azurite also coats part of the back. JC9556. Azurite, malachite. Blue Jay mine, Big Eightmile creek, Leadore district, Lemhi county, Idaho. 7 x 11.5 cm 329g. $30.00. A bit of malachite, not crystallized, coats the upper right area. Azurite is not quite as bright as the photo would indicate. JC9557. Azurite, tenorite. Blue Jay mine, Big Eightmile creek, Leadore district, Lemhi county, Idaho. 8 x 9.5 cm 375g. 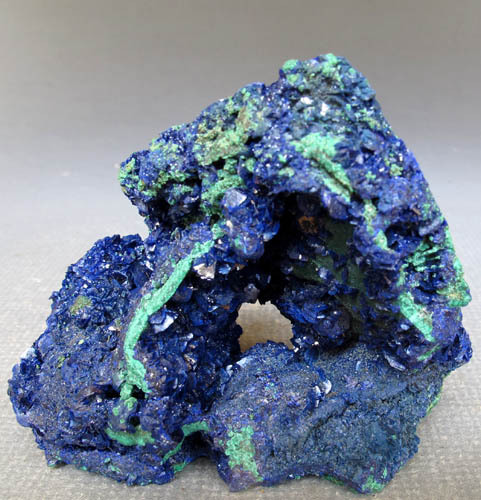 $30.00 Highly brecciated matrix has sparkly azurite coating the numerous breccia fragments and cements the whole specimen together Azurite is on the front, back, bottom and sides. From a small breccia pipe in altered granitic rock. The granite in the breccia pipe is highly fractured and the breccia fragments are variously coated with mostly azurite, varying amounts of tenorite, and small amounts of light green zinc rich malachite. Nearly all the specimens have some amount of contact marks due to the tight nature of the breccia fragments cemented in the pipe. The original find I found in 2002 had more malachite on the specimens and much lesser tenorite. .
JC9559. Azurite, tenorite. Blue Jay mine, Big Eightmile creek, Leadore district, Lemhi county, Idaho. 3.5 x 8 cm 100g. $12.00. Mostly black tenorite with dark blue azurite associated. JC9560. Azurite, tenorite. Blue Jay mine, Big Eightmile creek, Leadore district, Lemhi county, Idaho. 6.5 x 8 cm 184g. $18.00. Dark blue, somewhat botryoidal azurite on/with tenorite. Azurite on this one is not sparkly. JC9561. Azurite. Blue Jay mine, Big Eightmile creek, Leadore district, Lemhi county, Idaho. 5 x 13 cm 177g. $45.00. Sawn back. 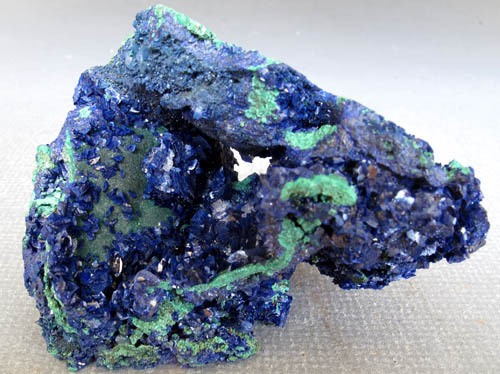 The azurite on this one has a bit of green highlights, which appears to be azurite being replaced by malachite. This is minor and shows slightly in the photo on the left side of the piece. JC9563. Azurite, tenorite. Blue Jay mine, Big Eightmile creek, Leadore district, Lemhi county, Idaho. 9 x 12.5 cm 526g. $35.00. Sparkly dark blue azurite on black tenorite for contrast on this large breccia fragment. JC9564. Azurite, tenorite. Blue Jay mine, Big Eightmile creek, Leadore district, Lemhi county, Idaho. 9.5 x 10 cm 297g. $40.00. Sawn back. Dark blue sparkly azurite coating black tenorite. The azurite is a bit darker blue than the photo would indicate. JC9565. Azurite. Blue Jay mine, Big Eightmile creek, Leadore district, Lemhi county, Idaho. 7.5 x 9.5 cm 219g. 60.00 Sawn back. Sparkly blue azurite just a bit darker than the photo would indicate. Minor malachite on the right edge. JC9567. Azurite, tenorite. Blue Jay mine, Big Eightmile creek, Leadore district, Lemhi county, Idaho. 10.5 x 11 cm 530g. $45.00. Sawn back. 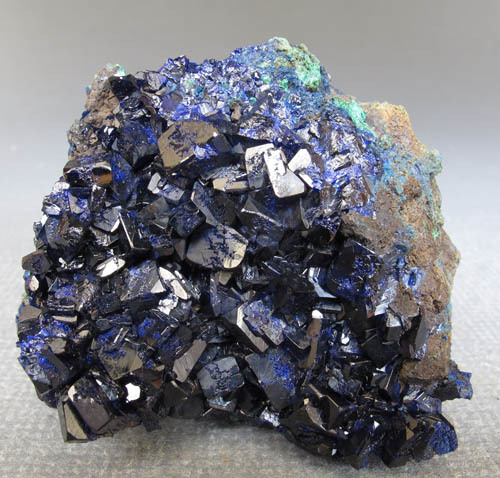 This piece is composed of a highly brecciated matrix with small pebbles all over the front that have been coated by azurite and cement the specimen together. The azurite is a bit sparkly in places, but is mostly just bright blue without much sparkle. The white areas are where breccia fragments abutted against other breccia fragments and sort of stuck together until the specimen was broken free. Black tenorite is associated as can be seen in the photo. JC9568. Azurite, tenorite. Blue Jay mine, Big Eightmile creek, Leadore district, Lemhi county, Idaho. 9.5 x 12 cm 597g. $45.00. Sawn back. 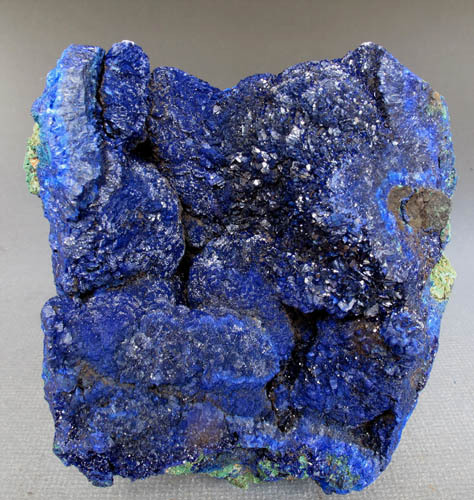 This piece is composed of a brecciated matrix with small pebbles partly coating the front and these have been partly coated by azurite and tenorite. The azurite is sparkly in places, especially on the left edge in the photo, but is mostly just bright blue without much sparkle. The white areas are where breccia fragments abutted against other breccia fragments. JC9570. Azurite, tenorite. Blue Jay mine, Big Eightmile creek, Leadore district, Lemhi county, Idaho. 8 x 11 cm 469g. $40.00. Sawn back. 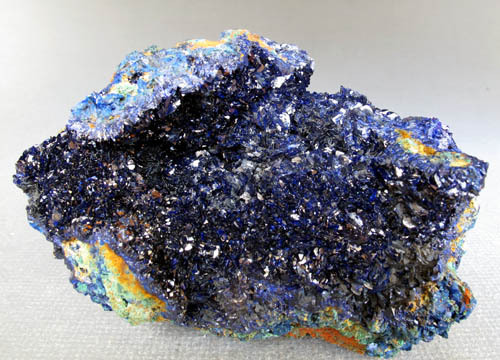 This piece is composed of a brecciated matrix with small pebbles partly coating the front and these have been partly coated by azurite and tenorite. The azurite is sparkly. The white areas are where breccia fragments abutted against other breccia fragments. JC9571. Azurite. Blue Jay mine, Big Eightmile creek, Leadore district, Lemhi county, Idaho. 9.5 x 12 cm 435g. $50.00. 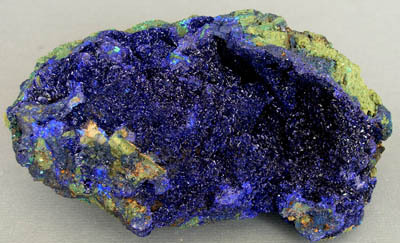 Bright blue, somewhat sparkly azurite coating a large breccia fragment. JC9573. Azurite. Blue Jay mine, Big Eightmile creek, Leadore district, Lemhi county, Idaho. 5 x 8 cm 137g. $30.00. Dark blue azurite, darker than the photo would indicate, coating a breccia fragment. Very minor malachite on the back. JC9574. Azurite, tenorite, malachite. Blue Jay mine, Big Eightmile creek, Leadore district, Lemhi county, Idaho. 6 x 9 cm 143g. $30.00. Sparkly blue azurite on the front, and nice contrasting azurite, malachite and tenorite on the back. A bit different than most. JC9575. Azurite, malachite. Blue Jay mine, Big Eightmile creek, Leadore district, Lemhi county, Idaho. 7 x 10.5 cm 322g. $30.00. Sawn base. Sparkly azurite on the front with a bit of malachite for contrast on the upper right. Minor azurite on the back also. JC9576. Azurite, tenorite. Blue Jay mine, Big Eightmile creek, Leadore district, Lemhi county, Idaho. 6 x 9 cm 193g. $30.00. Sparkly blue azurite coats the front of the piece. JC9577. Azurite, tenorite. Blue Jay mine, Big Eightmile creek, Leadore district, Lemhi county, Idaho. 5 x 7 cm 122g. $28.00. Sparkly blue azurite with minor malachite and tenorite, mostly on the back side. JC9578. Azurite, tenorite. Blue Jay mine, Big Eightmile creek, Leadore district, Lemhi county, Idaho. 5.5 x 6 cm 84g. $15.00. Sparkly blue azurite mostly on tenorite. JC9579. Azurite, tenorite. Blue Jay mine, Big Eightmile creek, Leadore district, Lemhi county, Idaho. 6.5 x 9 cm 198g. $15.00. Somewhat sparkly blue azurite with minor malachite and tenorite. Some azurite is also on the top right side, out of sight of the camera angle. JC9580. Azurite, tenorite. Blue Jay mine, Big Eightmile creek, Leadore district, Lemhi county, Idaho. 5 x 11 cm 140g. $30.00. Sparkly azurite on the front, with minor malachite on the right side. The back side is coated with sparkly azurite like the front side, but very little malachite is present on the back. JC9581. Azurite, tenorite. Blue Jay mine, Big Eightmile creek, Leadore district, Lemhi county, Idaho. 6 x 9 cm 241g. $20.00. This one is a little different...the azurite is in tiny, discrete, ball like blebs across the front, with a vertical band of light green malachite. The azurite does not have any luster on this one. JC9582. Azurite, tenorite. Blue Jay mine, Big Eightmile creek, Leadore district, Lemhi county, Idaho. 6.5 x 8.5 cm 172g. $15.00. Bright blue sparkly azurite on the front and top of this piece. JC9582. Tilted the specimen a bit forward to show the azurite on the top side. JC9584. Azurite, tenorite. Blue Jay mine, Big Eightmile creek, Leadore district, Lemhi county, Idaho. 6 x 7.5 cm 132g. $20.00. Sparkly to somewhat less sparkly azurite on and with tenorite. JC9501. Azurite, malachite. Bou Beker, Touissit-Bou Beker district, Jerada province, L'oriental region, Morocco. 7.5 x 16.5 cm $300.00. Ex Rocksmiths, Ex Ted Bartels collection. Dark blue azurite rosette like crystal groups on malachite. Older material not coming out anymore. JC9501. A closer view of the left end. JC9502. Azurite. Sierra Rica, Mun. de Manuel Benavides, Chihuahua, Mexico. 5 x 11 cm 249g. $120.00. Brilliant blue crystals on a quartz matrix. Sparkly. JC9488. Azurite, malachite. Liufengshan mine, Chichi county, Chizhou prefecture, Anhui province, China.7 x 13 cm 489g. $350.00. Not often seen are specimens from here with larger crystals. Most specimens are small druses of crystals. This nice piece has 1 cm crystals in a shallow vug with botryoidal malachite. Crystals have bright luster and display nicely. There are several broken crystals, mostly on the left side of the specimen. JC9488. Left side of specimen. JC9488. Right side of specimen. JC9486. Azurite. Milpillas mine, Cuitaca, Mun. de Santa Cruz, Sonora, Mexico. 3 x 5 cm 31g. $110.00 Bladed crystals on white matrix. JC9467. Azurite. Christiana mine, Kamariza mines, Agio Konstantinos, Lavrion district, Attiki prefecture, Greece. 6 x 8 cm 126g. $150.00. 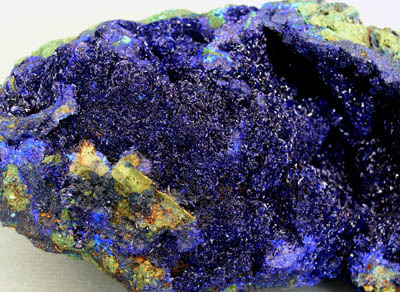 From the 2012 find at the mine, which produced some of the best azurite from this district. A solid mass of crystallized azurite in sparkly blue color that is most attractive. Nice piece, and these are quite scarce in this quality these days. JC9467. Another view, with a little more light exposure. JC9444. Azurite, malachite. M'Ssici, Alnif county, Tinghir province, Draa-Taflilalet region, Morocco. 3 x 6 cm 33g. $29.00. A cute and typical specimen from this nifty locality. JC9427. Azurite, malachite. Tsumeb mine, Tsumeb, Namibia. 4.5 x 7.5 cm 116g. $22.99 Crude azurite crystals with a bit of malachite. JC9419. Azurite. Sidi Ayed (Sidi Ayad), Boulemane Province, F�s-Mekn�s Region, Morocco. 3.5 x 9 cm 66g. $20.00. Bright blue drusy azurite in part somewhat botryoidal. Sawn back. JC9370. Azurite, malachite. Sidi Ayed, Boulemane province, Fes-Meknes region, Morocco. 7 x 12 cm 300g. $65.00. 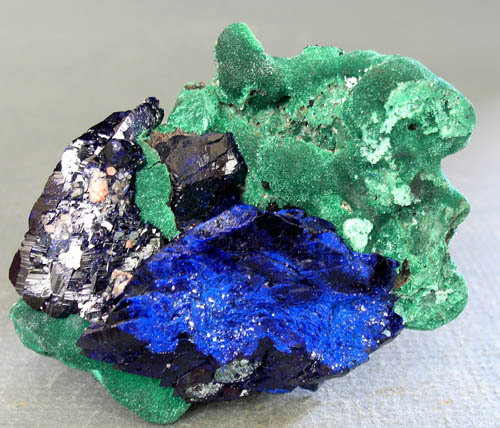 Deep blue drusy crystals in a vuggy matrix; the azurite appears to have formed on a thin layer of malachite. Sparkly azurite, colorful. Sawn back. JC9371. Azurite, malachite. Sidi Ayed, Boulemane province, Fes-Meknes region, Morocco. 7.5 x 13 cm 548g. $60.00 Deep blue drusy crystals in a vuggy matrix; there is a dark amorphous looking mineral coating some of the azurite, particularly on the back side. There are bits of massive quartz caught up in the azurite and show as white spots in the photos. The malachite is less obvious in person than the photos would indicate...little darker green. Sparkly azurite, colorful. JC9372. Azurite. Sidi Ayed, Boulemane province, Fes-Meknes region, Morocco. 9 x 12.5 cm 602g. $275.00. Intense, sparkly blue azurite coating massive quartz. Beautiful color and sparkle to the azurite. Really nice piece from here. I looked at a lot of specimens from Sidi Ayed at Tucson, 2018, and this is far and away the best one I saw. Has a sawn base and sits beautifully as shown here. 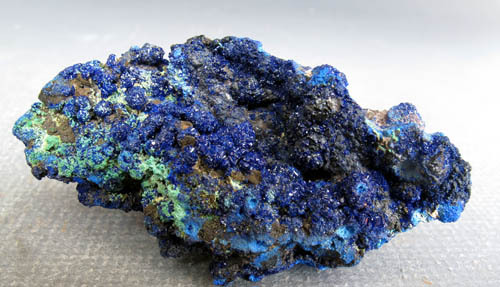 The azurite also coats most of the back, and other than the exposed quartz on the right side in this photo, the azurite wraps around the entire specimen. JC9364. Azurite, malachite. Khanong open pit, Sepon mine, Vilabouly district, Savannakhet province, Laos. 6.5 x 8 cm 140g. $140.00. Blocky brilliant crystals. Largest crystal is about 5mm, and most crystals are about that size or smaller. Color is a dark blue, which is much brighter in daylight as this photo shows. Sawn back. JC9358. Azurite, malachite. Liufengshan mine, Chichi county, Chizhou prefecture, Anhui province, China. 7 x 9.5 cm 315g. $110.00. Vug of somewhat larger than average, mostly bladed, drusy crystals. Quite a lot of Chinese azurite from this location at Tucson 2018. Literally tons of specimens, 99% of poor quality. This is one of a couple I thought were a bit better than average. Nice blue color, although the crystals are satiny in luster rather than glassy. JC9355. Azurite, malachite. Liufengshan mine, Chichi county, Chizhou prefecture, Anhui province, China. 7 x 8 cm 315. $110.00. Vug of somewhat larger than average drusy crystals. Quite a lot of Chinese azurite from this location at Tucson 2018. Literally tons of specimens, 99% of poor quality. This is one of a couple I thought were a bit better than average. JC9339. Azurite, malachite. Liufengshan mine, Guichi district, Chizhou prefecture, Anhui province, China. 11 x 18 cm >1000g (2.6 Lbs). $750.00 A large cabinet specimen from the Liufengshan mine, with larger crystals. Rarely does this mine produce crystals over a few mm in size; these are up to 7mm or so, and average about 5mm. There is very little damage to the main crystal exposures. There is one area on the very top of the specimen where it probably contacted the side of the vug/pocket it resided in that has damage This can be seen on the very top, slightly right of center, on the photo below this one. There a few areas of botryoidal malachite, some of it slightly iron stained, as can be seen. A very nice piece with good sized crystals for the location. A large cabinet specimen from my collection. JC9333. Azurite. Liufengshan mine, Chichi county, Chizhou prefecture, Anhui province, China. 6 x 6.5 cm 143g. $40.00. Bright blue sparkly drusy crystals. JC9331. Azurite, malachite. Khanong open pit, Sepon mine, Vilabouly district, Savannakhet province, Laos. 6 x 10.5 cm 227g. $175.00. 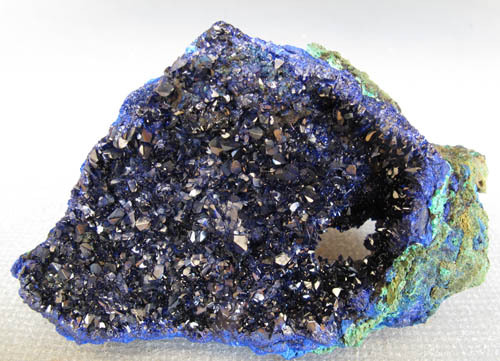 Vug with brilliant dark blue crystals. No damage to naked eye. JC9330. Azurite, malachite. Khanong open pit, Sepon mine, Vilabouly district, Savannakhet province, Laos. 7.5 x 8.5 cm 266g. $150.00. A bit of damage on the right side as seen in the photos. Brilliant dark blue azurite makes for a pretty specimen. JC9330. Another view showing where the damage is on the lower right in this photo. JC9327. Azurite, malachite. Khanong open pit, Sepon mine, Vilabouly district, Savannakhet province, Laos. 7 x 9.5 cm 520g. $150.00. Drusy crystals front and back. Matrix is a breccia cemented together by azurite/malachite. JC9316. Azurite. Touissit, Touissit-Bou Beker district, Jarada province, L'oriental region, Morocco. 7 x 11 cm 195g. $30.00. Drusy crystals with minor malachite. Sparkly. JC9313. Azurite. Milpillas mine, Cuitaca, Mun. de Santa Cruz, Sonora, Mexico. 4 x 7 cm 43g. $125.00. Groups of dark blue crystals scattered across the white matrix. There are a few broken crystals present. JC9313. Another view. I exposed this a bit longer to try to pick up the blue color of the crystals. JC9302. Azurite. Tsumeb mine, Tsumeb, Namibia. 3.5 cm tall. $45.00. A two centimeter azurite crystal tops this little group. Below it are half a dozen smaller azurite crystals. The termination on the main crystal is flat. There is a bit of malachite present, darker than the photo would indicate. JC9292. Azurite, malachite. Milpillas mine, Cuitaca, Municipio de Cananea, Sonora, Mexico. 4 x 4 x 5 cm tall. 45g. $150.00. Brilliant crystals perched on matrix. Pretty miniature. JC9295. Azurite. Milpillas mine, Cuitaca, Municipio de Cananea, Sonora, Mexico. 5 x 6 cm 86g. $120.00. Small cabinet specimen of brilliant blue crystals. JC9295. Another view, back side? Depends on how its displayed. JC9287. Azurite, malachite. Milpillas mine, Cuitaca, Municipio de Cananea, Sonora, Mexico. 4 x 4.5 cm 40 g. $175.00. A single crystal that appears to have overgrown a malachite core. 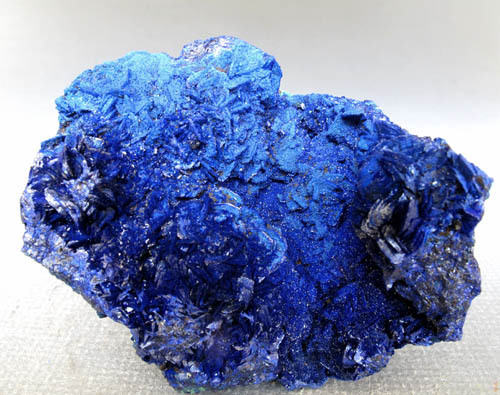 Other bright blue crystals are associated. Great luster. Several views are shown. This one looks better in person...tough to photo. JC9288. Aurite. Blue Jay mine, Big Eightmile creek, nr. Leadore, Lemhi county, Idaho 6.5 x 12 cm 298g. $25.00. 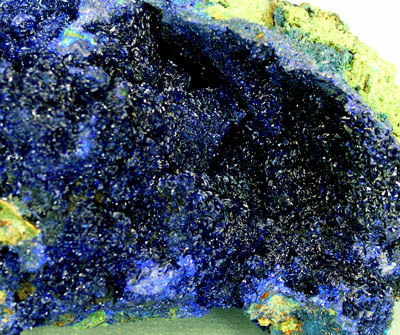 A plate of bright blue, microcrystalline azurite coating a breccia matrix. Collected in 2002. I found a couple of these stashed away in a mislabeled flat. Thought I had sold all the larger pieces. JC9289. Azurite, malachite. Khanong open pit, Sepon mine, Vilabouly district, Savannakhet province, Laos. 4 x 7 cm 93g. $100.00. Brilliant, drusy azurite coating botryoidal malachite. Hard to tell in the photo, but this is a nice little vug containing the crystals of azurite. Pretty. JC9263. Azurite, malachite. Milpillas mine, Santa Cruz, Sonora, Mexico. 3.5 x 4 cm 24g. $80.00. A 1.5 cm crystal perched on matrix. Crystal has a small ding on termination, shown in last photo below. JC9244. Another view, close up. JC9226. Azurite. Milpillas mine, Cuitaca, Mun. de Cananea, Sonora, Mexico. 3 x 4 cm 22g. $100.00. A single 3 cm crystal on matrix. No damage even though it looks like it the way it formed. JC9226. Another view, slightly different angle. JC9203. Azurite, malachite. Tsumeb mine, Tsumeb, Namibia. 6 x 9 cm 158g. $175.00. Prismatic, satin luster crystals, many being pseudo morphed by malachite. Not as bright as they could be, but nice crystallization. Several are incomplete/broken. JC9133. Azurite. Shilu mine, Yangchun county, Yangjiang prefecture, Guangdong province, China. 6.5 x 8 cm 320g. $220.00. Dark blue, satiny luster crystals on this ball of azurite. Minor damage (rubbing) here and there, not obvious. JC2604. Azurite, malachite. Liufengshan mine, Chichi county, Chizhou prefecture, Anhui province, China. 5.7 x 6.3 cm 101g. $125.00. One of the earlier specimens from this locality, purchased in September 2003. 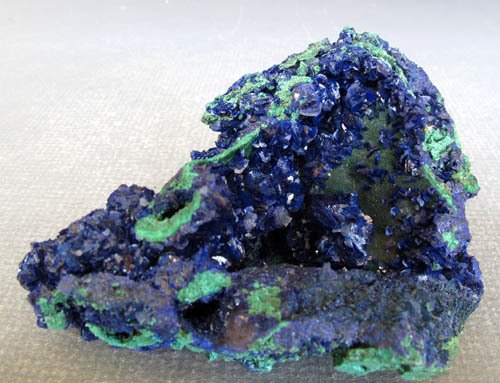 Bright, dark blue crystals on green malachite. Ex Crowley collection #1674. JC2607. Azurite, malachite. Liufengshan mine, Chichi county, Chizhou prefecture, Anhui province, China. 4.5 x 4.5 cm. 91g. $125.00. 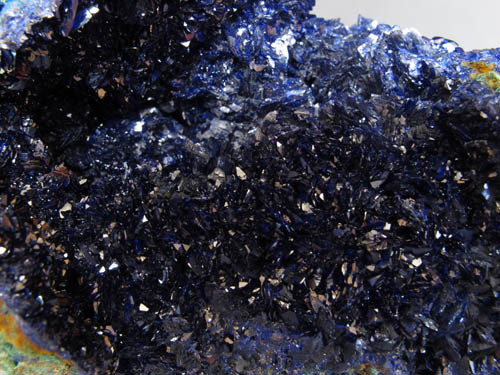 Dark blue, larger crystals in a vug. One of the earlier specimens from this locality, purchased in September 2003. Bright, dark blue crystals on green malachite. Ex Crowley collection #1675. JC9123. Azurite, malachite. Liufengshan mine, Chichi county, Chizhou prefecture, Anhui province, China. 7 x 11 cm 235g. $155.00. Lots of Chinese azurites from this locality...this one is better than the average quality, with brilliant, sparkly crystals. No damage either, which is not common among these. JC9099. Azurite, malachite. Khanong open pit, Sepon mine, Vilabouly district, Savannakhet province, Laos. 3 x 4.5 cm 26g. $125.00. A nice miniature featuring a main crystal of the classic type from here. 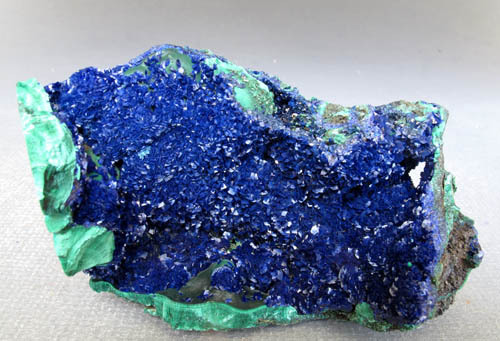 The azurite was replaced by malachite and in turn coated with azurite, giving this great, vibrant, schiller like blue color. There is a broken crystal in the front that shows the malachite rather clearly, and a crystal on the side that is both malachite and azurite. JC9099. Side view. I need to reshoot this one...too blurry, but gives an idea anyway. JC9101. Azurite, malachite. Khanong open pit, Sepon mine, Vilabouly district, Savannakhet province, Laos. 5 x 8.5 cm 261g. $225.00. Classic, bladed, thin crystals, featuring several crystals of the classic type from here. 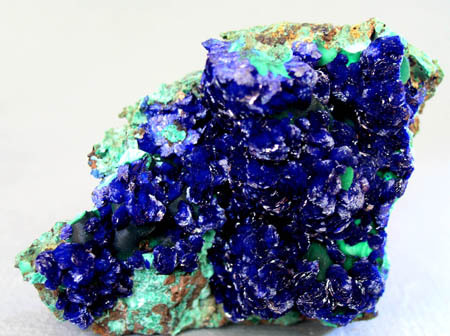 The azurite was replaced by malachite and in turn coated with azurite. 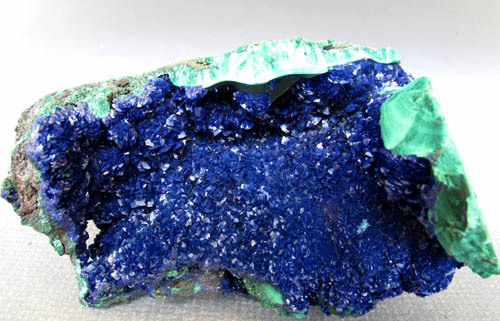 In this specimen the azurites appear to be altering back to malachite, or the azurite never completely covered the replaced crystals. There is some damage along the top edge. The crystals are darker than I prefer, and a tough specimen to photograph. JC9094. Azurite. Bou Beker, Touissit-Bou Beker district, Jerada province, L'oriental region, Morocco. . 7 x 7 cm 223g. $50.00 Large, dark blue crystals on black matrix. JC9046. Azurite, malachite. Liufengshan mine, Chichi county, Chizhou prefecture, Anhui province, China. 4.6 x 8 cm 184g. $78.00 Brilliant blue crystals coating matrix. Sparkly. JC9045. Azurite, malachite. Liufengshan mine, Chichi county, Chizhou prefecture, Anhui province, China. 4.2 x 7 cm 197g. $130.00. Somewhat larger crystals, brilliant blue with great luster. This one reminded me of the Sepon mine azurites, but is definitely Liufengshan mine. JC9044. Azurite, malachite. Liufengshan mine, Chichi county, Chizhou prefecture, Anhui province, China. 6 x 7 cm 254g. $145.00. Somewhat larger crystals on malachite. The malachite, in places, looks like it may have replaced earlier azurite...hard to tell though. JC9028. Azurite. Milpillas mine, Cuitaca, Municipio de Cananea, Sonora, Mexico. 5 x 9 cm 98g. $375.00 Flat plate with larger crystals on the wider end, with smaller crystals to the narrower part of the specimen. Nice luster. JC8863. Azurite. El Cobre mine, Concepcion de Oro, Zacatecas, Mexico. 3.5 x 4.5 cm 78g. $20.00 Dark blue crystals from the post 1960's big find. These came out a few years later. JC8838. Azurite. El Cobre mine, Concepcion de Oro, Zacatecas, Mexico. 7 x 10.5 cm 502g. $150.00. 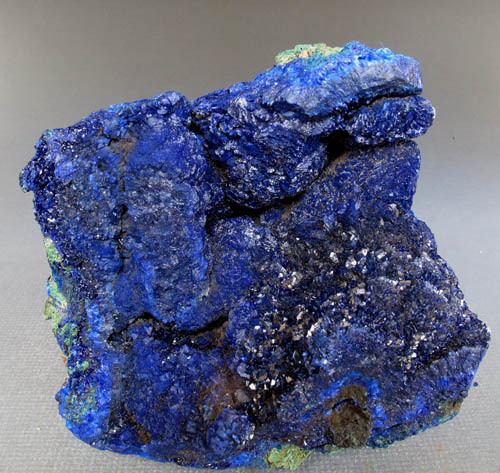 Specimen has small micro-crystals of brilliant blue azurite scattered throughout the specimen. From the big find of the 1960's. Cabinet specimens of this size are fairly rare these days. JC8838. A rather poor close up. JC8779. Azurite. Tsumeb, Namibia. 2.5 x 7 cm 41g. $30.00 Aggregate of long crystals ON SALE, TAKE 20% OFF THE MARKED PRICE. JC8340. Azurite, malachite, conichalcite? Christiana mine, Kamariza mines, Agio Konstantinos, Lavrion district, Attiki' prefecture, Greece. 5 x 7.5 cm 61g. $75.00. Balls of brilliant blue azurite coat most of the specimen. Some green malachite is associated. The dealer I got this from said there is conichalcite present also. JC8292. Azurite. Kinsevere mine, Katanga, Democratic Republic of the Congo. 2 x 4.5 x 8.5 cm wide. 104g. $125.00. Blue mass of sharply bladed crystals. Very nice specimen from this relatively new deposit in the Congo. JC8290. Azurite, malachite. Apex mine, Jarvis peak, Tutsagubet district, Beaver Dam mountains, nr. St. George, Washington county, Utah. 5.5 x 8 cm. 202g. $65.00. Hard to find Apex mine specimens these days. This is a nice representative specimen. Several photos show each side. The bottom had a gob of blue silica putty on it the previous owner used to make it stick to a stand....I cleaned as much as I could, but there is still some there. JC7608. Azurite, malachite. Azurite, malachite. Aouli, Upper Moulouya lead district, Midelt, Khenifra province, Meknew-Tafilalet region, Morocco. 4.5 x 8 cm 215g. $65.00. Brilliant blue drusy crystals on hematite/limonite stained quartz/barite matrix. ON SALE, TAKE 20% OFF THE MARKED PRICE. JC7032. Azurite, malachite. Liufengshan mine, Chichi county, Chizhou prefecture, Anhui province, China. 4.5 x 6.5 cm 152g. $135.00. Deep blue, bladed crystals. JC6826. Azurite, malachite. Lavrion district, Attiki prefecture, Greece 3 x 6.5 cm 56g. $48.00. Pretty, sparkly blue crystals with minor malachite. JC5683. Azurite, malachite. Milpillas mine, Sonora, Mexico. 5 x 6.5 cm 106g. $225.00. Up to 4 cm crystals nested in velvet malachite. The brilliant blue area is where the crystal had some bits of white (sandstone?) embedded on the edges of the crystal...maybe where it was contacting the other side of the pocket? 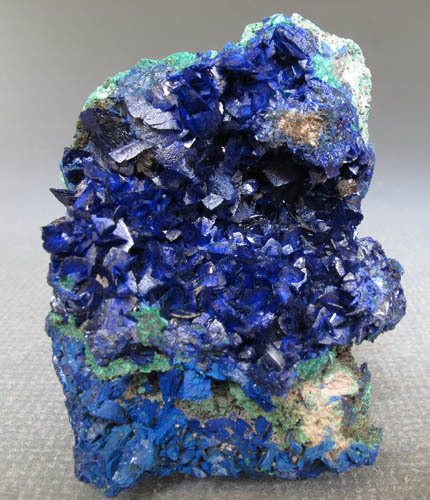 Another large bladed azurite crystal is in the upper right area of the specimen in this photo. It has a few fragments of the white (sandstone?) embedded in it. Pretty piece, with no damage to the naked eye. The malachite is slightly darker green than the photo would indicate. JC4991. Azurite, malachite. Liufengshan mine, Chichi Co., Chizhou prefecture, Anhui prov., China. 4 x 6 cm 107g. $70.00. Bladed blue crystals on botryoidal malachite. ON SALE, TAKE 20% OFF THE MARKED PRICE. JC4990. Azurite, malachite. Liufengshan mine, Chichi Co., Chizhou prefecture, Anhui prov., China. 5 x 6.5 cm 143g. $75.00. Bladed, blue crystals on botryoidal malachite. ON SALE, TAKE 20% OFF THE MARKED PRICE. JC4688. Azurite. Liufengshan mine, Chizhou prefecture, Anhui prov, China. 4 x 6 cm 97g. $90.00 Brilliant royal blue, bladed crystals on dark green malachite. ON SALE, TAKE 20% OFF THE MARKED PRICE. JC4273. Azurite, malachite. Liufengshan mine, Chichi county, Chizhou prefecture, Anhui province, China. 5.5 x 8.5 cm 154g. $135.00. Nice vug of crystals. ON SALE, TAKE 20% OFF THE MARKED PRICE. JC4031. Azurite, malachite. Liufengshan mine, Chichi county, Chizhou prefecture, Anhui province, China. 6 x 7.5 cm 145g. $75.00. Vug lined with crystals. ON SALE, TAKE 20% OFF THE MARKED PRICE. JC3884. Azurite, malachite. Liufengshan mine, Chichi county, Chizhou prefecture, Anhui province, China. 5 x 6 cm 145g. $100.00. Nice distinct crystals. ON SALE, TAKE 20% OFF THE MARKED PRICE. JC3468. Azurite, malachite. Liufengshan mine, Chichi county, Chizhou prefecture, Anhui province, China. 6 x 7.5 cm 258g. $175.00. Dark royal blue azurite on the base and sides grading to brilliant electric blue near the top. Pretty. ON SALE, TAKE 20% OFF THE MARKED PRICE. JC3466. Azurite, malachite. Liufengshan mine, Chichi county, Chizhou prefecture, Anhui province, China. 5 x 7.5 cm 217g. $140.00. 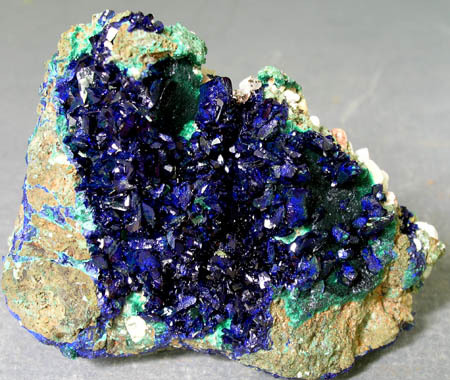 Bright blue small blades and rosettes of azurite on dark green malachite. ON SALE, TAKE 20% OFF THE MARKED PRICE. JC3718. Azurite, malachite. Liufengshan mine, Chichi county, Chizhou prefecture, Anhui province, China. 4.5 x 5 cm 181g. $100.00. Blocky, cubic looking crystals. ON SALE, TAKE 20% OFF THE MARKED PRICE. JC3718. A slightly different angle. JC3712. Azurite, malachite. Liufengshan mine, Chichi county, Chizhou prefecture, Anhui province, China. 9 x 10 cm >1000g. $225.00 A thick piece of botryoids covered with bladed to slightly more blocky crystals. Better in person. ON SALE, TAKE 20% OFF THE MARKED PRICE. JC3710. Azurite, malachite. Liufengshan mine, Chichi county, Chizhou prefecture, Anhui province, China. 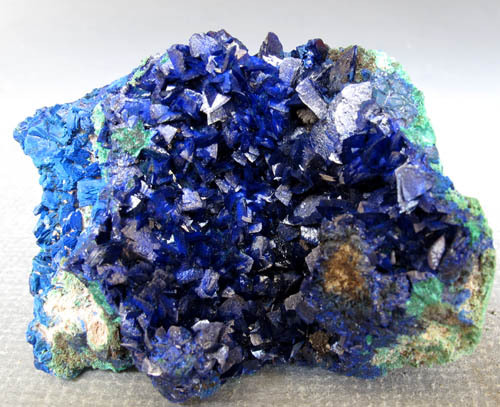 6.5 x 11 cm 590 g. $200.00 Bright blue, highly lustrous crystals in a shallow vug. Lots of sparkle here. No damage. ON SALE, TAKE 20% OFF THE MARKED PRICE. JC3710. A close up view. JC3465. Azurite, malachite. Liufengshan mine, Chichi county, Chizhou prefecture, Anhui province, China. 4.5 x 6 cm. 136g. $100.00. Bright blue blades of azurite on velvety malachite. ON SALE, TAKE 20% OFF THE MARKED PRICE. JC3463. Azurite, malachite. Liufengshan mine, Chichi county, Chizhou prefecture, Anhui province, China. 6.3 x 7.5 cm 212g. $175.00. Mass of bladed crystals with good luster. ON SALE, TAKE 20% OFF THE MARKED PRICE. JC3404. Azurite, malachite. Liufengshan mine, Chichi county, Chizhou prefecture, Anhui province, China. 3.5 x 5.5 cm 87g. $85.00. Bright rosettes of crystals on malachite. There is very minor rubbing of the malachite as can be seen in both photos. ON SALE, TAKE 20% OFF THE MARKED PRICE. JC3404. Another slightly different view. JC3381. Azurite, malachite. Liufengshan mine, Chichi county, Chizhou prefecture, Anhui province, China. 9.5 x 13 cm 738g. $200.00. 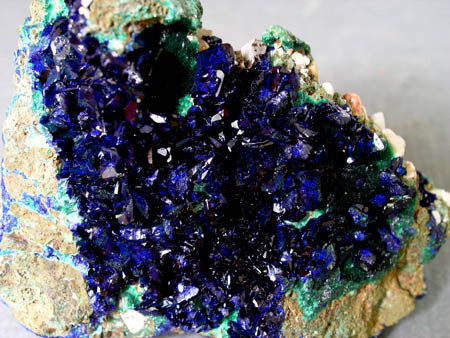 A large cabinet specimen with a vug filled with sparkly royal blue crystals. Pretty. A couple of small rub spots as can be seen in the lower photos. ON SALE, TAKE 20% OFF THE MARKED PRICE. JC3381. Close up of the left side. JC3381. Close up of the right side. JC2605. Azurite, malachite. Liufengshan mine, Chichi county, Chizhou prefecture, Anhui province, China. 5.7 x 9.5 cm 191g. $175.00. Brilliant, somewhat acicular crystals of gemmy blue crystals. Nice specimen. A cut above the average for specimens from here. ON SALE, TAKE 20% OFF THE MARKED PRICE. JC4720. Azurite, dolomite. Puit IX, Zelidja mine, Touissit dist., Oujda-Angad prov., Oriental region, Morocco. 2.5 x 5.3 cm 153g. $45.00 An undamaged 3 cm doubly terminated crystal. One of the best pieces. Looks better in person. I took several views, front, back and ends. ON SALE, TAKE 20% OFF THE MARKED PRICE. JC4720. Another view. Back Side. JC4720. Another view. More from the back side showing the termination. JC4720. Another view. This is the termination on the other end. JC4720. Another view. Trying to show the termination, which is composed of several small faces.